Trinkets are a set of prop jewelry, made by Mada as the August 2005 freebie at Faerie Dreams. 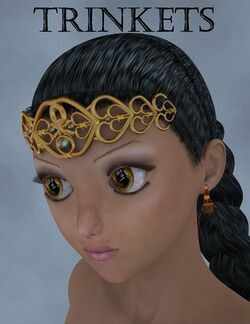 The set consists of a filigree headband smartpropped for the Preteen Girl and a pair of acorn earrings set up for Aiko 3. This page was last edited on 13 June 2018, at 00:38.